IT HAS BEEN AWHILE SINCE I HAVE DONE AN ADVENTURE IN THE GREAT WHITE NORTH. BUT WITH MY NEW "REAL JOB", I HAVE THE MONEY TO PAY FOR "THE ROCKET TOUR" INSTEAD OF CASHING IN MY EMPTY BEER BOTTLE COLLECTION. 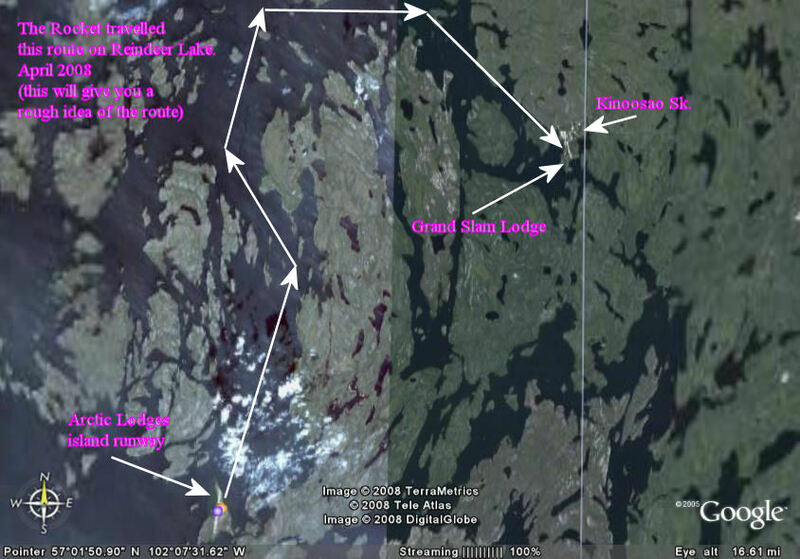 AFTER 2 YEARS AND 2 TRIPS (JULY 2006 AND JULY 2007) TO LOOK AT "THE ROCKET" SITTING AT www.arcticlodges.com ISLAND RUNWAY. I DECIDED IT WAS TIME TO BRING HIM HOME TO THE "KINGDOM". IT HAS BEEN OVER 50 YEARS SINCE "THE ROCKET" WAS CAT TRAINED FROM THE YARD I NOW CALL THE "KINGDOM". I LOADED UP THE "SCREAMING FORD" WITH THE D6 9U KNOWN AS "THE HOOD" AND THE "STONE BOAT" FROM THE "DOUBLE J ADVENTURES" THAT BROUGHT THE "KOMMUNIST KAT" HOME. I ASK RON FROM BROCHET MB TO JOIN ME ON THIS TRIP SINCE HE IS VERY BUSH SMART. XENA WENT SOUTH TO VISIT FRIENDS WHICH I'M GLAD BECAUSE IT WAS SO COLD. FIRST TIME IN TEN YEARS THAT XENA HAS NOT BEEN APART OF THE FUN IN THE GREAT WHITE NORTH. 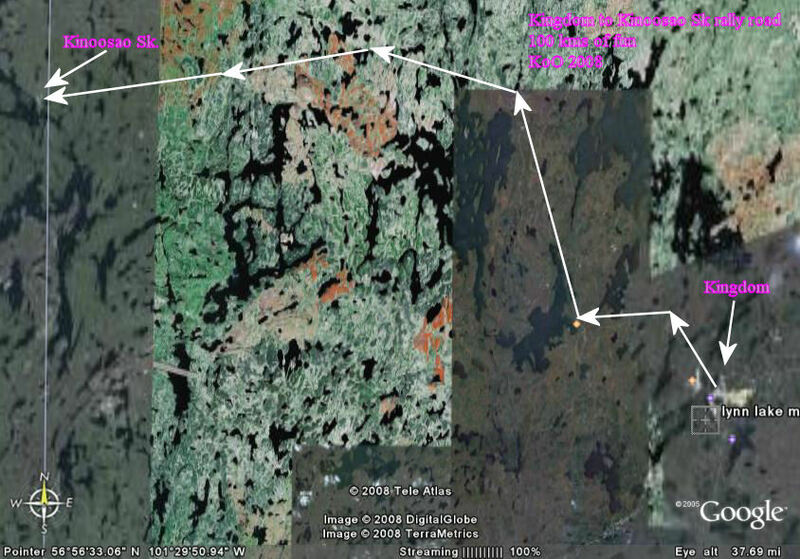 I USED MY MAGIC MARKER ON MY COMPUTER TO MARK UP THIS GOOGLE EARTH PICTURE. THIS WILL GIVE YOU AN IDEA OF THE "KINOOSAO RALLY ROAD" AND WHERE IT GOES IN RELATION TO THE "KINGDOM". ALSO I'M COLOUR BLIND AND I WILL PICK THE COLOURS I WANT. XENA WAS NOT IN THE "KINGDOM" WHEN I MARKED THE PHOTO. IF SHE WAS HERE, PINK WOULD NOT HAVE BEEN CHOSEN, LOL. 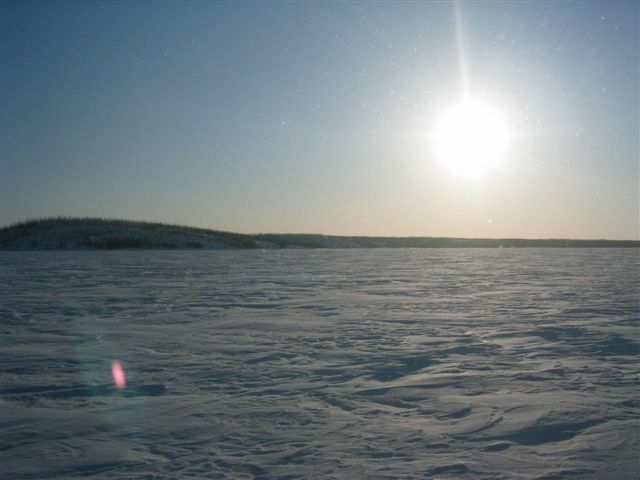 RON AND I HEAD OUT FROM LYNN LAKE MANITOBA ON THE FAMOUS KINOOSAO RALLY ROAD AT -30c ON APRIL 3 2008. YES IT IS APRIL IN THE GREAT WHITE NORTH AND STILL COLD BUT NO BUGS, LOL. 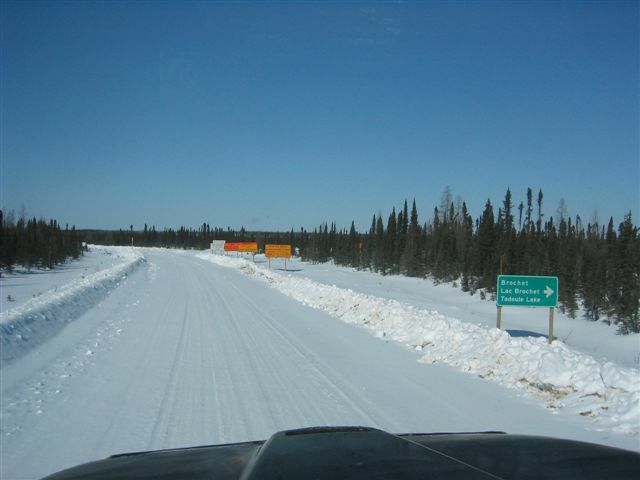 WE PASS THE WINTER ROAD TO RON'S HOME TOWN OF BROCHET MB. OF COURSE HE JOKES THAT WE SHOULD JUST MAKE A QUICK TRIP TO BROCHET MB IN THE "SCREAMING FORD". ONE OF THE THINGS THAT MAKES THE KINOOSAO RALLY ROAD SO NEAT IS ALL THE WATER THAT RUNS ACROSS THE ROAD DURING THE SPRING. BECAUSE IT HAS BEEN SO COLD, THE WATER JUST FREEZES IN LAYERS ON THE ROAD. NOW YOU GET TO DRIVE THROUGH WATER AND ICE THEN CLIMB A STEEP SNOW COVERED HILL NO MATTER WHICH DIRECTION YOU TRAVEL. THE MORE VEHICLES THAT SPLASH THROUGH THE WATER CAUSES THE HILLS TO BECOME MORE ICY BECAUSE OF THE WATER DRIPPING FROM THE BOTTOM OF THE VEHICLES. I CALL IT SELF ICING THE ROAD. IN THE GREAT WHITE NORTH, THE HIGHWAYS DEPARTMENT DOES NOT SAND THE HILLS LIKE THEY WOULD DO IN THE SOUTH. IT ADDS TO THE ADVENTURE OF TRAVELING THE KINOOSAO RALLY ROAD. REMEMBER I KNEW THE RISKS OF TRAVELING THE KINOOSAO RALLY ROAD BEFORE I LEFT THE "KINGDOM". THIS ROAD HAS BEEN IN NUMEROUS ADVENTURES, WHICH IS HALF THE FUN. ONE THING ABOUT THE KINOOSAO RALLY ROAD IS YOU HAVE TO KNOW WHAT OTHERS ARE DOING. 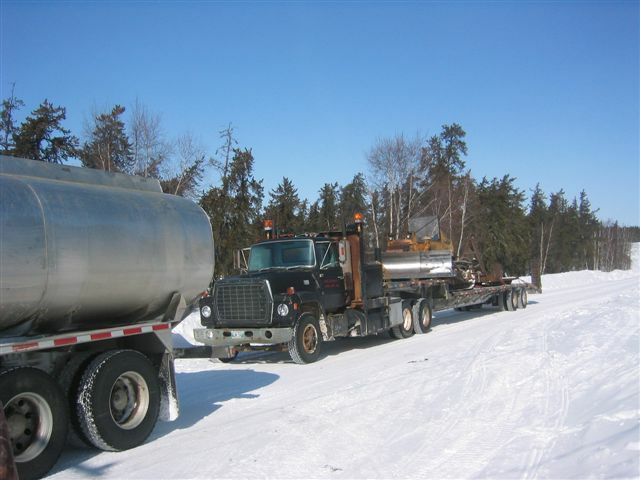 TWO FUEL TRUCKS WENT TO KINOOSAO SK AND WERE NOT TO LEAVE THE COMMUNITY UNTIL WE ARRIVED. 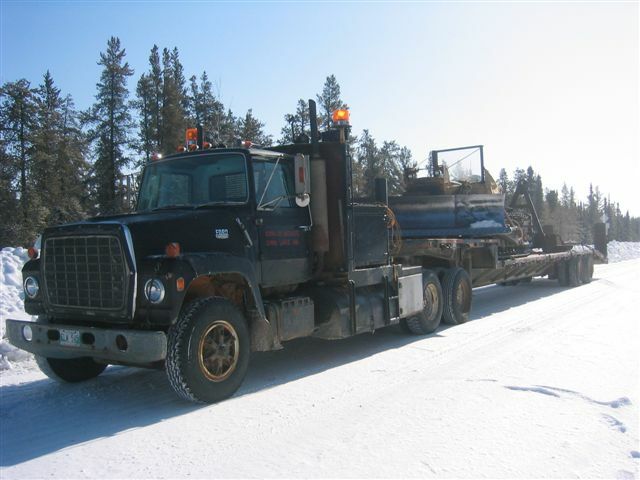 ONE THING YOU DON'T WANT TO DO IS MET OTHER BIG TRUCKS ON THE ROAD WHEN IT IS SNOW COVERED. TEDDY AND THE OTHER DRIVER ENJOYED LUNCH AND A COFFEE WAITING FOR THE "SCREAMING FORD". 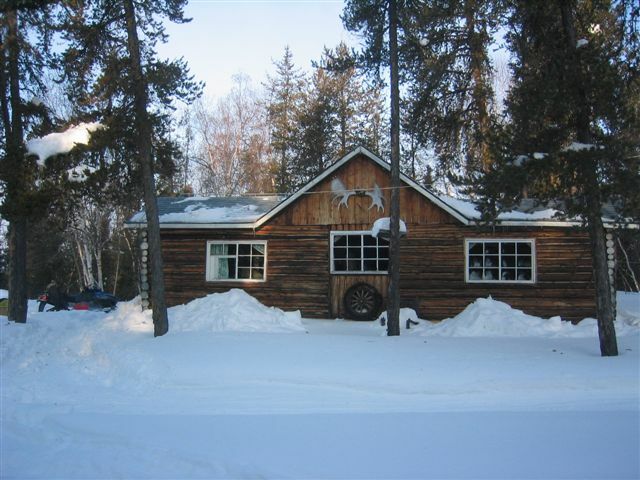 RON AND I STAYED AT www.grandslamlodge.com WHICH IS AT THE SOUTH END OF KINOOSAO SASK. 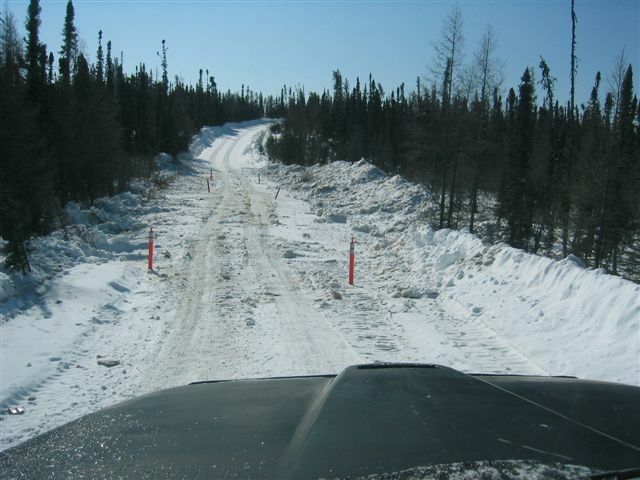 I PLOWED THE ROAD TO LODGE BECAUSE IT WAS ONLY ACCESSIBLE BY SKI-DOO. 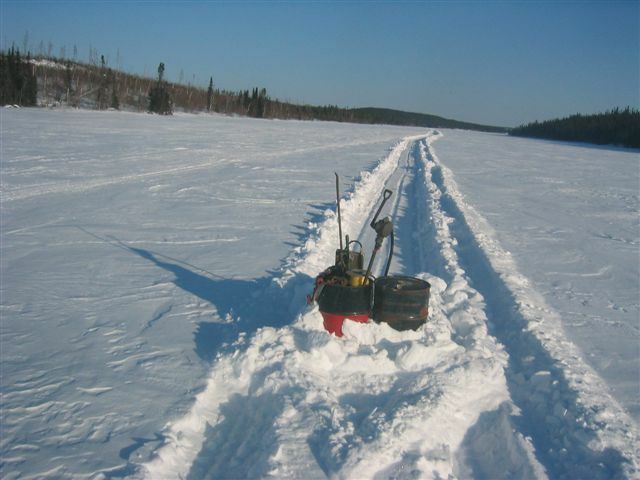 THE SKI-DOO IS THE MAIN MODE OF TRANSPORTATION IN THE GREAT WHITE NORTH. 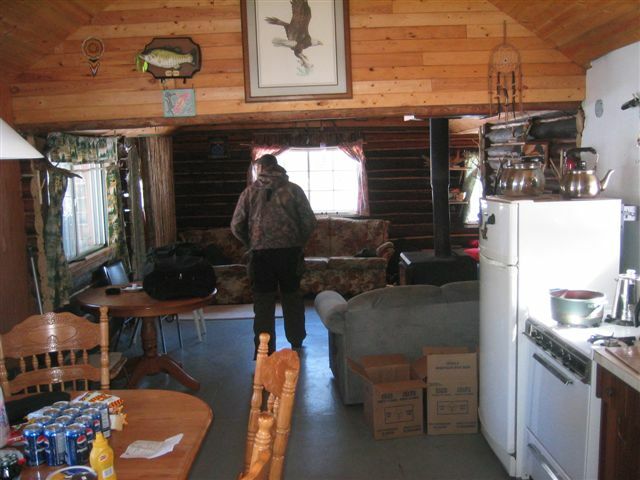 RON AND I WERE VERY IMPRESSED AT ALL THE COMFORTS OF HOME THAT WERE INCLUDED IN THE CABIN. 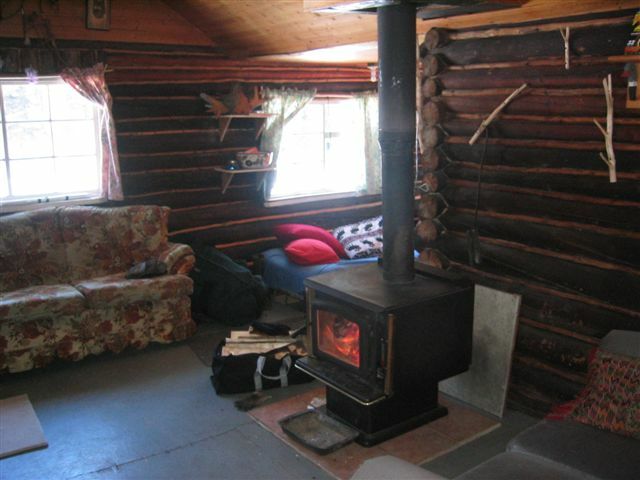 FOR IT BEING SO COLD OUTSIDE, THE CABIN WAS TOASTY WARM. 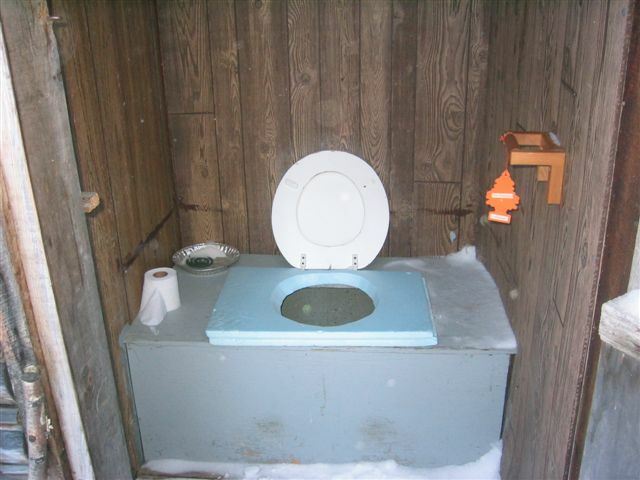 I GUESS FLOYD THE OWNER WHO BUILD THE CABIN KNEW WHAT HE WANTED IN CABINS AT THE LODGE. IT MAKES A BIG DIFFERENCE WHEN YOU GROW UP HERE IN THE GREAT WHITE NORTH. 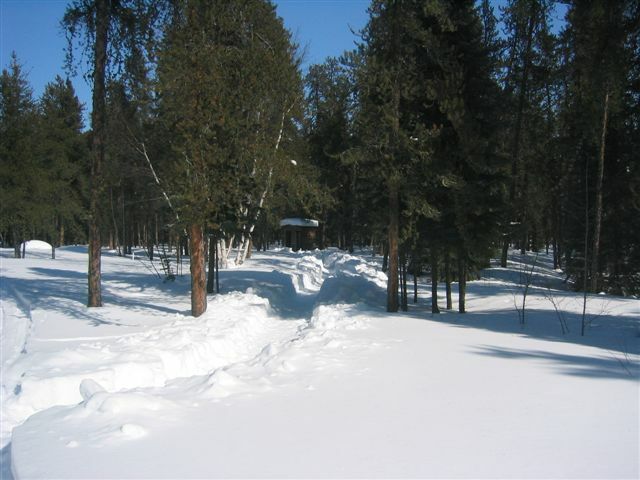 FLOYD EVEN HAD THE PATH SHOVELED TO THE OUTHOUSE, WHICH WAS VERY NICE. I THINK HE WAS AFRAID I WAS GOING TO PLOW THE TRAIL WITH "THE HOOD", LOL. 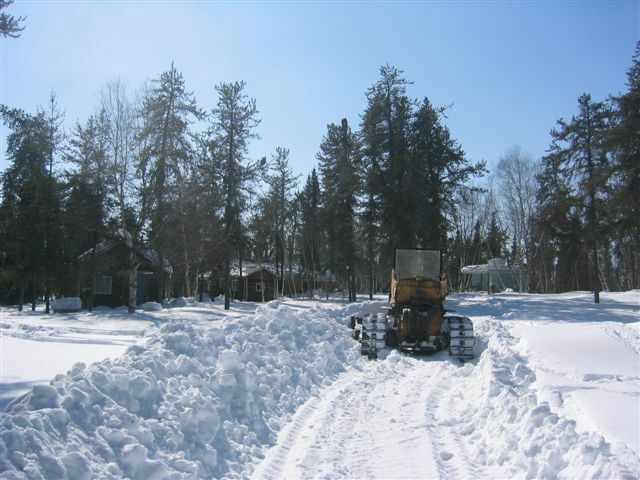 I HEAD OUT WITH "THE HOOD" AFTER DOING SNOW IN KINOOSAO SK FOR THEIR WINTER CARNIVAL PLUS A FEW DRIVEWAYS. 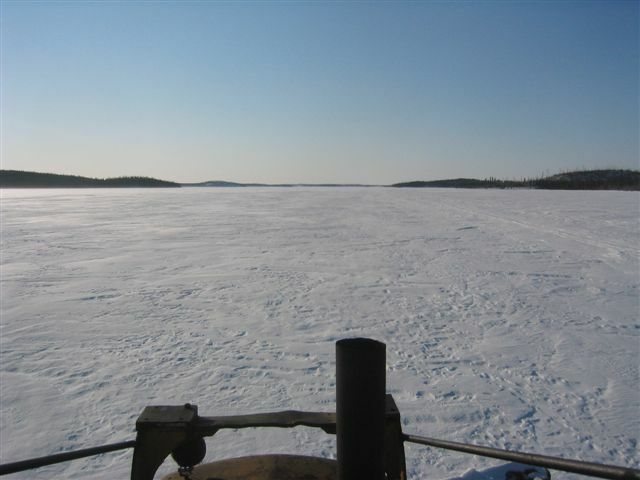 I HAVE 20 MILES OF ICE TO GET TO THE ISLAND RUNAWAY WHERE "THE ROCKET" IS WAITING TO BE RESCUED. THE STONE BOAT IS LOADED WITH SUPPLIES AND I JUST DRAG IT ALONG. NO SENSE IN PLOWING A ROAD BECAUSE THE ROAD CAN BE LOST WITH A CHANGE IN WEATHER. REINDEER LAKE AT ITS FINEST, WHERE I CAN WALK ON WATER. IT IS A GOOD SIGHT TO SEE RAYMOND AND RON COMING BACK TO "THE HOOD". RAYMOND AND RON SCOUTED OUT A TRAIL TO ISLAND RUNWAY. SINCE "THE HOOD" IS ONLY TRAVELING IN 3rd GEAR BECAUSE OF THE SNOW CONDITIONS, WE HAD TO TRAVEL UNTIL 10:00 PM TO MAKE THE MOST MILEAGE TO THE ISLAND RUNWAY. 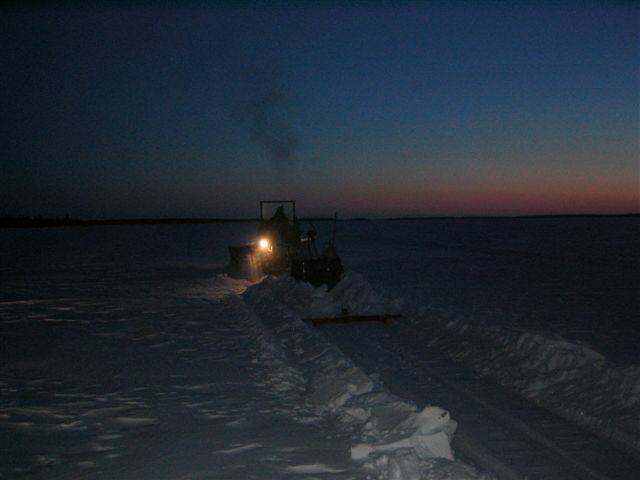 WE LEFT "THE HOOD" RUNNING FOR THE NIGHT TWELVE MILES FROM KINOOSAO SK. NOT BAD FOR A LATE START. 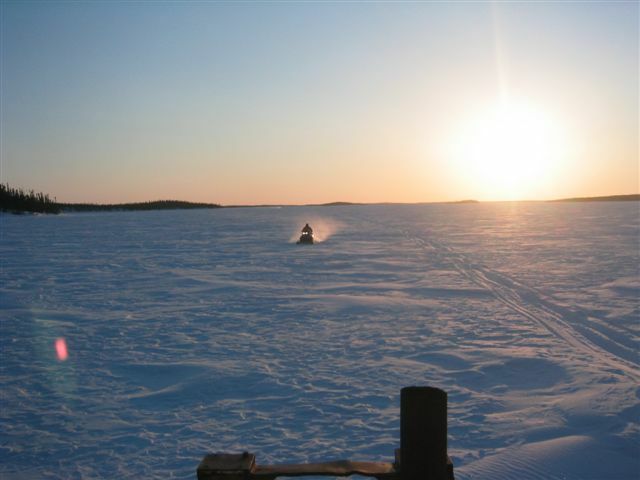 THE SKI-DOO RIDE BACK TO GRAND SLAM LODGE WAS VERY COLD, IT IS THE COLDEST I EVER BEEN. 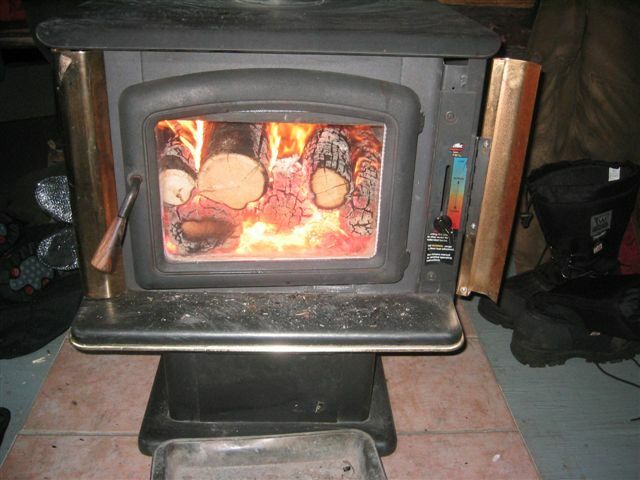 THE WOOD STOVE WAS THE BEST THING GOING BECAUSE I HAD NO ONE TO CUDDLE ON THE COUCH WITH. END OF DAY ONE WHICH WAS A EIGHTEEN HOUR DAY. THE COUNT DOWN TO "THE ROCKET LAUNCH"